All of TGC's instructors have been trained by Coach Des to use all TGC principals and philosophies and are professional in approach and knowledge. Coach Des is a native of Calgary, AB, where he played youth and Junior Hockey. Des attended and played for Minnesota State University (MSUM) from 1995-1998 where he earned team MVP his senior year as well as the Senior Male athlete of the year award. Coach Des played Professional hockey from 1998-2000 in Germany and United States before volunteering as goaltending coach at MSUM from 2000-2009. Together with former goaltending partner, Craig Lindsey, Des formed TGC in 2002. In April 2005 TGC was selected as, and continues to be, the goaltending choice of National Champion Shattuck St. Mary’s (SSM) Prep School in Faribault, MN (TGC provides goaltending consultants to SSM). Over the years, Coach Des has helped numerous goaltending prospects move on to the college and pro ranks, such as: Oscar Dansk (Columbus Blue Jackets, NHL), Kevin Murdock (Lake Superior State University, WCHA), Nick Kossoff (Lake Superior State University, WCHA), Brady Hjelle (Tulsa Oilers, ECHL), Eric Schierhorn (University of Minnestoa, B1G), Austin Lee (Minnesota State University, WCHA), Cole Huggins (Minnesota State University, WCHA), Peter Traber (Harvard University, ECAC), Taylor Crosby (Northeastern University, Hockey East), Tyler Bruggeman (St. Scholastica Saints, NCHA), Anthony Brodeur (Drummondville Voltigeurs, QMJHL). Coach Des owns a Masters Degree in Education Administration and has coached goaltenders for over 25 years. Coach, his wife Liz, and twins Claire and Liam, reside in Mankato, MN with dog Kipper. Coach Grant is from Apple Valley, MN where he grew up and played youth hockey for Apple Valley, Eastview, and Lakeville's youth hockey associations. He then went on to play 3 years of Varsity hockey at Eastview High School. Grant trained with TGC for 5 years, including 2 years of Prodigy Camp. Since 2006 Grant has been actively involved with TGC, private lessons, Association training and evaluations, summer day and boarding camps, the annual TGC Holiday Camp, and Sunday Skills Sessions. He is a recent graduate of Miami University's Farmer School of Business with a Bachelor's degree in Marketing. Grant will continue to work with youth associations and provide a professional training. Coach Garrett is from Salinas, California where he grew up playing roller hockey before transitioning to ice hockey at the age of 10 where he played for the Cupertino Cougars and San Jose Jr. Sharks organizations. He then went on to attend and play 4 years at Shattuck St. Mary’s including the Prep team his senior season. Garrett continued playing with two seasons of Junior A hockey for the Alpena Ice Diggers (NAHL) and Northern Cyclones (AJHL) before deciding to pursue a Bachelor of Design degree in Architecture at the University of Minnesota Twin-Cities where he currently attends. Garrett trained with TGC for 6 years, including 4 years at Shattuck with Coach Des and 4 years of Prodigy Camp. Since 2008, Garrett has been actively involved with TGC including private lessons, association training (Hutchinson 2011-2012, Chaska 2012-2013, Owatonna 2012-2013), summer day and boarding camps where he works as on-ice instructor, evaluations of campers, off-ice instructor, and on-ice video analysis of each goalie, and lastly Sunday skills sessions at Shattuck. Garrett will continue to work private lessons, Sunday skills at Shattuck, and with youth associations while providing professional training. Coach Danny is from Woodbury, MN where he grew up playing in the Woodbury Area Hockey Club as well as spending hours on the outdoor rinks. He went on to play 3 years at Hill Murray, being a part of 2 State Tournament teams. After high school, he went on to play 1 season with the University of St. Thomas. Danny trained for 5 years with Coach Des and The Goalie Club before transitioning to a coach. Since then, Danny has been a coach at multiple summer camps, Sunday Skills Sessions, and private lessons. Away from TGC, Danny is a graduate of the University of St. Thomas with a Bachelor’s degree in International Management. Coach Jason is from Lakeville Minnesota, where he started playing hockey at the age of 5, with the Lakeville Hockey Association. He made the transition to goaltender after playing hockey for 5 years. For his entire goaltending career, Jason has trained exclusively with TGC for 9 years, with 5 years of Prodigy camp. During his first camp, fellow training partner, and now coach, Isaak Tjaden, gave Jason the nickname of “Kermit” which he is regularly referred to at TGC. At Lakeville North High School, Kermit played one year of 16U, one year of Junior Varsity, and two years of Junior Gold ‘A’. Kermit started coaching at TGC in 2013 with summer camps, seasonal clinics, and private lessons. He currently attends Winona State University, pursuing a degree in Mass Communication, while participating in Cross Country and Club Hockey. Coach Isaak, a native of Northfield, Minnesota and started playing hockey at the age of 6 as part of the Northfield Hockey Association. Coach Isaak transition to goalie at the age of 8 and began training with The Goalie Club two years later. Isaak played for Northfield High School for four years making it to the Section 1 A championship his senior year. 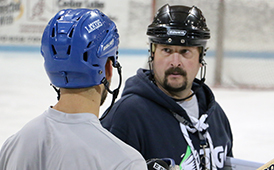 After high school Coach Isaak moved on to play Junior Hockey first for the Twin Cities Northern Lights (MNJHL) where his team took second in the National Tournament. He also played for the Minot Minotauros (NAHL), El Paso Rhinos (WSHL), and the Billings Bulls (AWHL). Coach Isaak is currently playing hockey at Gustavus Adolphus College where he is working towards a Bachelor of Arts degree in Management. Coach Isaak has trained with The Goalie Club since 2004 and began training in the Prodigy program in 2008. Coach Isaak has been coaching with The Goalie Club since 2012 and is involved with Sunday Skills Sessions, Private Lessons, as well as all summer camps where he works as an on ice instructor, dry land instructor, classroom instructor, and goalie evaluator. Coach Shari, a native of Richmond, MN, is a former USA National Team goaltender and was an alternate for the 2006 Olympics in Turin, Italy. She earned a scholarship and played four years at Minnesota State University-Mankato where she earned MVP honors all four years. She was an All American and a finalist for the Patty Kazmeier trophy for the top female NCAA player in the country. She completed her Master’s Degree in Exercise Physiology in 2008 and became an assistant coach of the Girls Prep Team at Shattuck-St. Mary’s School, who won the USA Hockey U19 Girls National Championship in April of 2009. She has worked full time for the past 6 years as assistant coach with her alma mater, the MSUM women's hockey program. Shari has an extraordinary passion toward increasing knowledge of TGC goalies. She continues to develop and improve the innovative, goaltender-specific, off-ice program that is designed to make TGC goalies more explosive, agile, and flexible. Shari began training with Coach Des while at MSUM and is currently assistant coach at Minnesota State University Mavericks.